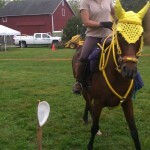 September 18th – I have sent in my entry and I plan to ride the 25 mile CTR. If my back fails me, so be it. 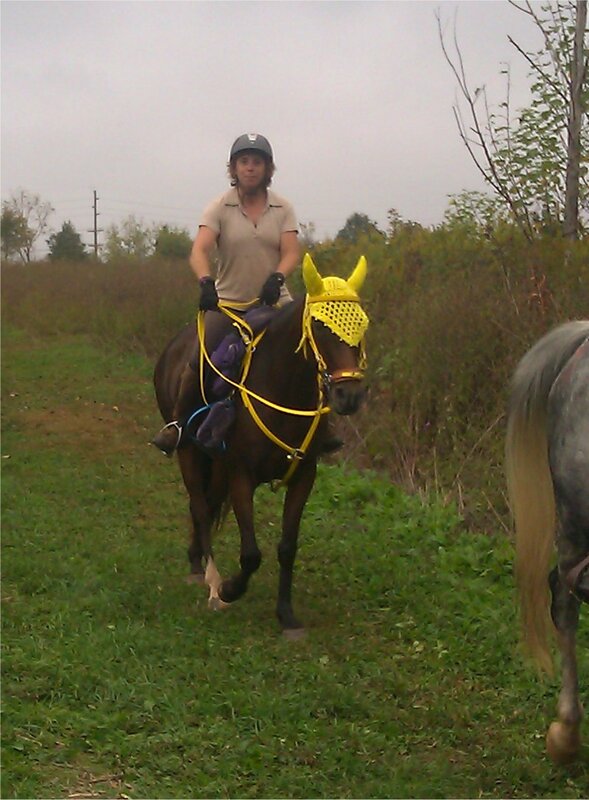 It’s the last ride for 2013 and I want to finish the season riding my own horse. October 4th – two days before the ride and my back is WAY hurting. I swear, I am going to go no matter what and if I die, well, someone might miss me. I put the word out that Miss Daizy needs a rider (sigh) No way I would be able to suffer through a fast 25 miles, even with Aleve. I could have backed down to the CDR (12.5 miles) but I refuse. 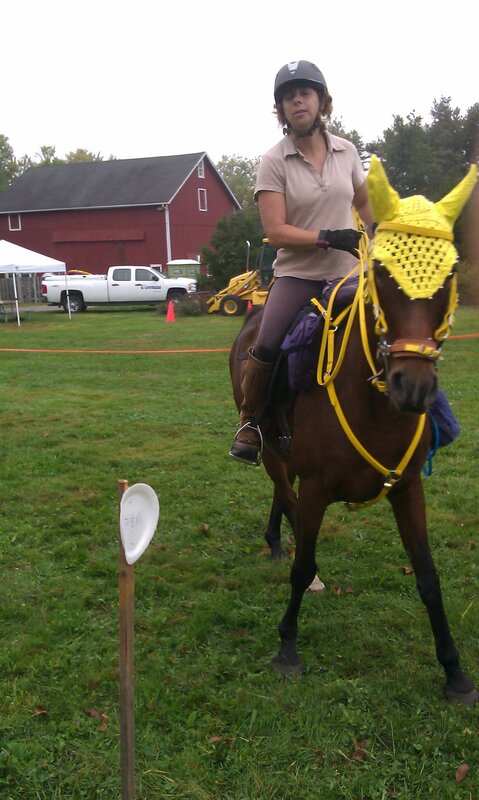 There is another story about that … Sherry is going to ride her and I’m going to help out as a volunteer. October 6th – THE RIDE! Somerset, NJ at Blackwells Mills Ranger Station. So, here I am, three months after being secretary for The Muckleratz Ride and breaking The major rule I swore I would never (ever!) break. DO NOT CONTACT RIDE MANAGEMENT WITH LAST MINUTE CHANGES THE DAY BEFORE THE RIDE. October 5th, I contact the Ride Manager and tell her I can’t ride due to my back and ask her if she knows of anyone without a horse, please put them in contact with me. I know DARNED WELL that she has more to worry about than finding a rider for Miss Daizy. Sandy graciously finds me a rider so I contact the Ride Secretary and give her the rider changes and tell her I will be there to volunteer, so find me a job. Like she hasn’t already got jobs under control – it *IS* the day before the ride, you know. Jessica tells me since I stole her Timer to ride my horse at the last minute, that is now my job (chuckle) and I better be on the grounds before 6:00 am. Now … how did he know my name was The Lady? I arrived at 6:13 am … I’m late, but so is about 10 other rigs that pulled in behind me. I found Jessica (who is stressed to the max) and Sandy (who is her typical laid back “Whatever” self) and I wandered around with Miss Daizy waiting on the vet and lay judge to arrive so they could start vetting in. Seems that where I backed in my rig, someone had placed some dark green water buckets (which I did not see in the dark) to hold that spot for someone that was to arrive in the morning. NO! I did not run over the water buckets but I was very close beside them. While I was unloading Miss Daizy from the trailer, I could hear the people in the rig next to me getting upset that I took their friend’s parking space. They even called me a name (that made me sad). I started to get out of the trailer and apologize then move my rig over a spot ) because they were very upset. I changed my mind on that when I heard another (very familiar voice) tell them that it was bad manners to “save a space” the morning of a ride when most riders are coming in. That’s a new one on me. Not that I have ever saved a space – I’m always the one that someone else is saving space for (chuckle). However, I am going to remember that little piece of etiquette for the future. Apparently, Miss Daizy has her own fan club of people I don’t know because two people (that I do not know) came up and asked me if this was Miss Daizy. Startled by the notoriety she has accomplished this year, I admitted she WAS the famous Miss Daizy. (Gotta love Facebook – Miss Daizy posts things on there all the time.) She was petted and complimented and I grinned ear to ear! I am a very bad CTR competitor. Miss Daizy and Sherry seems to be getting along just fine. Sherry is totally unaware that Miss Daizy is a bouncing maniac during tack time time and Sherry just moves along with her (back and forth, front to rear) and never ceases smiling. I am most entertained! Sherry got her mane all braided and tack on without getting stepped on, so that’s all good. 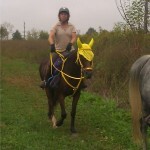 She mounted up, ready to go out on trail and Miss Daizy was TOTALLY focused on getting to work. I love this horse! I did bring a yellow shirt for Sherry to wear, but when I saw how tiny Sherry is I knew that she would be swimming in the shirt so I didn’t bother. 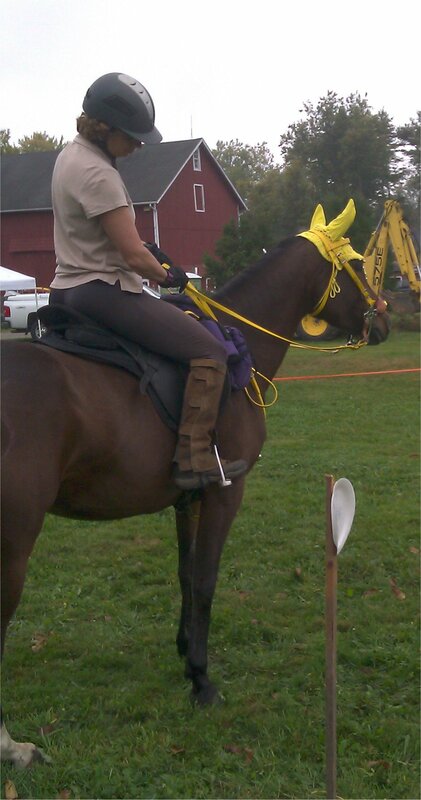 Melissa chided me for my lack of providing properly fitting yellow attire for the rider (chuckle). Jessica hooks me up with Mike and we’re the timer’s for the day. Seems that Mike is getting quite the reputation for being a most excellent timer. I told him I would try not to embarrass him during the course of the competition. He smiled like he knew that situation. I actually had a very good time with him, he has a lot of interests the same as me and the time (no pun intended here) passed very quickly. At the halfway vet hold, I watched Sherry and Miss Daizy vetting. I got very concerned when I saw them doing hands on checks on her after her trot out. I told Mike to hang on, I’d be right back and I headed over there to see what was wrong. Apparently, there was some miscommunications with the vet and lay judge and they were doing hands-on to all the horses at the vet check. O M G. No wonder the vetting got so jammed up. 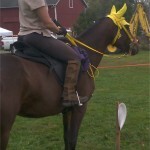 Over half the riders had to get extra time on their ride because the were help up at vetting. I tried to find Jessica to tell her what was happening at the vetting, but she was out on trail so was unavailable for me to speak to. Miss Daizy was just fine at the half way and she ate up all her treats and slurpy. Back out they went to finish the ride, Miss Daizy had her ears forward and tail up doing her little Arab trot (I hate that Arab trot, bounces me right out of the saddle). There were some trail mishaps. I received three calls from three different riders that they couldn’t find their way back from the 2 Miles To Go marker. I learned later that a total of 12 CDR and CTR riders all had the same issues at this point in the trail. It’s all good, every body found their way back to base camp and although the day was rift with “time issues”, I understand everyone that completed did get their mileage for the day. And that’s all that matters in the scheme of things. Sherry and Miss Daizy had a good ride. Apparently Miss Daizy was off her game at this ride as she scored a 91 out of 100. Seems her trot out at the end was a little lethargic (lost points), she got a new bump on the other side of her wither (lost points) But I firmly believe that bump was there before the ride. I’m pretty sure I pointed out both bumps to the lay judge, sadly they only marked down one bump on one side. (shrug) Her heart rate at the end of the ride was 48 (40 is the HR they’re looking for at the end) so she lost points. Her respiration was little off, too. It was 16 and at all the other rides she’s done she has been at 6 or 8. Her gut sounds and other metobolics changed (points lost). That kinda amazes me because she ate everything put in front of her all day, including the treats. She didn’t drink much, though, and that could have had an impact on her gut sounds. And she was girthy – and that is normal for her – so she lost points for that, too. BUT NOW … for the real ride story! For those of you that have read my book, To Finish Is To Win, you KNOW that getting to or getting home from the ride is usually where my adventure begins. Today’s adventure begins a couple months back and finishes on the ride home. Sit down, get your cup of coffee and get ready. I bought a new USED truck in May 2013. Mostly for my business Any Pet Groomed, but the intention was to have a dual use to pull my trailer to rides. It’s a great truck, I get great gas mileage when I’m running around grooming, and I’ve been mostly pleased with it since I got it. I say mostly because I have had it into the service department twice about the transmission. On both occasions they checked it out and told me it was fine. Now, the first time I had it in it was because I didn’t feel that it was shifting correctly. Seemed to run the RPM’s way too high before shifting, and the shift was hard – like it jarred me. I don’t know a whole lot about auto trans, I prefer a manual trans so when they told me that’s how it is supposed to shift, I accepted that. When I took it in the second time, I told them that sometimes it didn’t engage right away when I stepped on the gas pedal and that didn’t seem right to me. They said they tested it and that’s how it’s supposed to shift. What do I know. Okay, I accepted that. I coasted into an abandoned truck stop parking lot and when she wouldn’t go forward in a coast any more, I stopped. Man, oh man. Silence greeted me on the phone. The trucker kept me company until Marc arrived to save Miss Daizy from sleeping with truckers all night. THANK YOU MR. ANONYMOUS TRUCKER DUDE! I was so completely wrapped up in the loss of my transmission that I never asked him his name. I’m so sorry about that. He was very nice to help me out. I called the dealer and they made arrangements to pick up the truck and get it repaired. I did some research on the internet today about the trans and found out that it is NOT supposed to do all the things I had complained about AND this particular trans has a lot of issues. A LOT OF ISSUES. This makes me sad because if the trans is going to be a problem I need to trade this truck and get a different one. I like this truck but if she is not going to be reliable, I need to get on with my life in a different truck. So, that is my story and I’m sticking to it. I may do some revisions and add some things that I forgot about … but right now, this is all she wrote!